Do Things Happen in Threes? Mr. Starfish's grandmother says things "happen in threes". Unfortunately, it's usually about something bad that's happened but does it work for good things? 'Cause I won another giveaway! 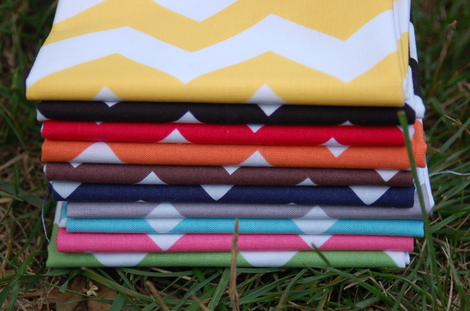 I won a fat quarter bundle of Riley Blake Chevrons from Faith at Fresh Lemon Quilts sponsored by Westwood Acres! Thanks Faith! I love this print and I love the colors. The thing is, I haven't seen many quilts featuring these fabrics. I've seen them mostly used as accents or stash builders. So.... what should I make with them? In other news.... 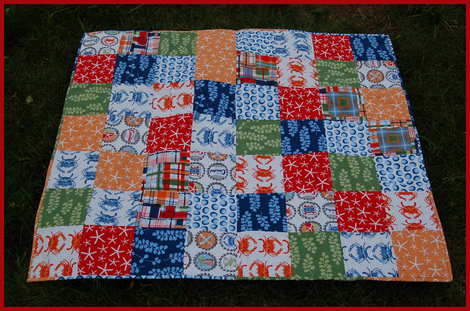 I finished a simple patchwork quilt with the Goin' Coastal bundle I bought a long time ago. It's about 39"x44" and backed with a royal blue Kona solid. Love the beachy theme! Crabs for everyone! Congrats on the win. They are some pretty op-art looking colors. I'm sure you'll put them to good use. i also still love the going coastal quilt. 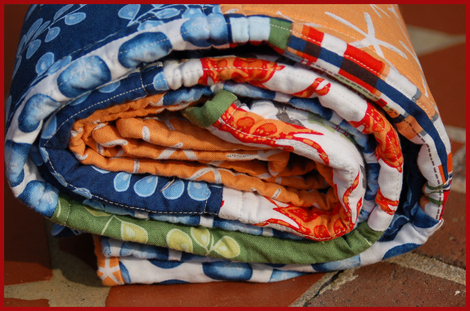 i love a good patchwork quilt with fun colors. Congrats on your winning streak! 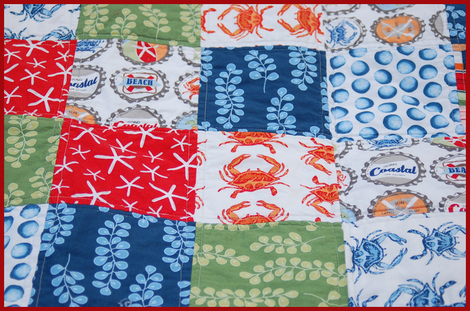 Love the coastal quilt. 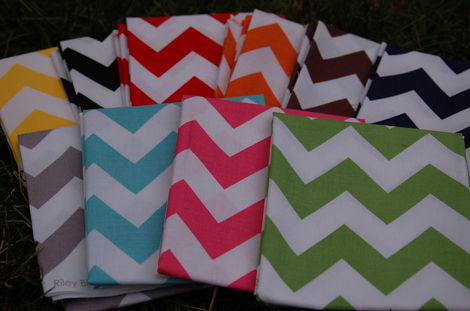 I'm afraid I am no help on the chevrons...I admire them but am just as stumped as to how best to use them. Maybe a set of really bold placemats? This page contains a single entry from the blog posted on May 17, 2012 9:41 PM. The next post in this blog is Index Card a Day 2.